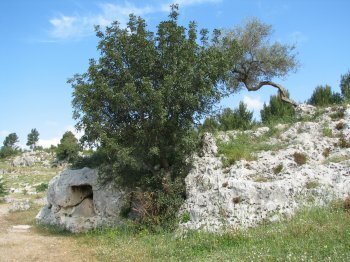 Syracuse and the rocky Necropolis of Pantalica is an ecclectic site that bears testimony to the development of Mediterranean civilisation in the past 3000 years. It houses monuments of exceptional value from different periods within this timespan. The Necropolis of Pantalica consists of about 5000 burial chambers, hewn out of the rocks. They date from the 13th to the 7th century BC, and were made by the Sicani (indigenous people of Sicily). In Syracuse (Siracusa) itself there are two designated areas: the archeological park of Neapolis and Ortygia. Greek and Roman monuments can be found at the Neapolis park, including a sanctuary to Apollo and a Greek theatre. 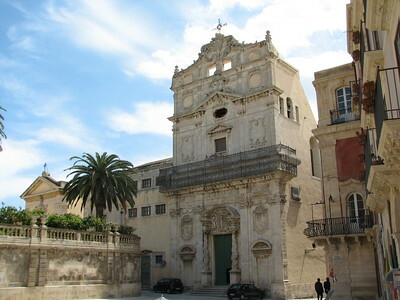 On the island of Ortygia there are also ancient Greek remains, together with many splendid medieval churches and palazzi constructed by the Byzantines, Arabs, Normans, Bourbons and Aragonese (to name but a few of the many rulers Siracusa has seen in its history). Siracusa owns an old Mediterranean heart in Ortygia, a harbour Venetian or Cretan in its looks. Crumbling buildings, a street market, colourful balconies, drying laundry from the windows: a true delight to the senses. There's nothing else to do than wander the quiet streets, peeking around corners and awe at the ubiquitous churches and palazzi. The attractive and open Piazza Duomo (I found it hard to find at first) has the most prominent buildings. Like in some of the other places I visited in Sicily there is a lot of reconstruction going on. Ortygia's Duomo is one of the monuments that's under scaffolding at the moment. Don't let this put you off visiting, there's so much more to see. I didn't get into any of the buildings, just roamed around and had a fine time. Siracusa is well on the beaten path for the general tour groups, I noticed even a cruise ship disembarking its passengers here for a visit! I skipped Neapolis due to an Ancient Greek/Roman overdose I felt coming, but did manage to get to the necropolis of Pantalica. About an hour outside of Siracusa, it can be reached via a scenic road that shows the Sicilian countryside at its best. The drive there on small mountain roads, lined by olive trees and the occasional village (pretty Ferla!) is actually more worth it than the burial site itself. To the untrained eye, the burial chambers that held whole families are merely holes in the rocks. Visited in May 2014. I spent half a day in the historic center of Syracuse located on Isola di Ortigia, so, I have not seen other parts of this WHS that might be more interesting and more important in respect to OUV than Ortigia. It was pleasent day strolling in the narrow streets and enjoying views to Ionian sea... However, I must say I prefer other towns in Sicily, especially those located on the top of hills or in the deep valleys such as nearby Ragusa Ibla, Modica and Scicli (also WHS) and many many others. I visited this WHS in May 2015. The rock-cut tombs of Pantalica are nothing special visually and I had more fun hiking in the Mediterranean environment rather than actually enjoying what's left to see of these tombs. On the other hand, Syracuse in general but specifically the sites in Ortigia are a great summary of what Sicily has to offer ... temples, amphitheatres, remains, baroque churches, great food, narrow alleys adorned with ornate balconies, friendly people, sea, sun and good food. 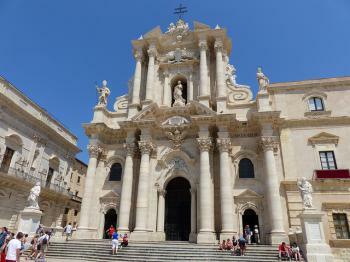 I enjoyed my time in Syracuse as a starter of what Sicily has to offer. The town is quite touristy overall so nothing really off the beaten track (except Pantalica but only for WHS enthusiasts really). However, I would still advise anyone who visits Sicily to come here at least for a day or two. The highlight of my visit was definitely the Temple of Athena which has been converted to a church through the ages. Syracuse is a large site to visit. There is the archaeoligical park with the ruins of a large Greek theater, a Roman amphitheater, and a huge altar of sacrifice. 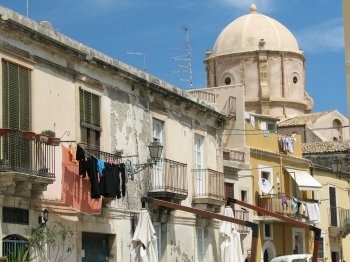 In the oldest section of Ortygia you can see nice examples of Gothic architecture (houses and churches), Greek remains, and views of the sea. One of the most interesting sights is the main cathedral. At the front it has an 18th century facade put on after a devastating earthquake, but walk to the side and you see the archaic columns in the walls. This church was built within a large ancient Greek temple and many of the portions of the temple are still visible. A really remarkable place to visit. Along the shoreline of Syracuse you will see rocks with square cuts in them, a source of the stone used to make the ancient buidlings. Other quarries exist inland. These served as prisons of the Athenians captured during their attack on the city. In the quarry by the Villa Politi you can see the beginnings of the sculpture of a Greek column. Something not often mentioned is that Syracuse has Christian catacombs. A visit to them is quite the experience. Don't go too far from your guide because it is really easy to get lost! The ancient port city of Siracusa was the main target for our all too brief excursion to South Eastern Sicily, and it was well worth the effort to get there. The heart of the city lies on the island of Ortygia, and as said elsewhere the real charm lies in just wandering around the tight lanes, peeking down narrow alleys and arriving at beautiful squares. Continuously developed from the 9th Century BC Siracusa was a hugely important Greek colony rivalling Athens, and matching the importance of the Phoenician stronghold of Carthage. Some of the greatest names of Greek civilisation lived here, most notable were Plato, Pindar, Aeschylus and Archimedes. The later actually designed some of the fortifications of the city. On the main land the ruins at Neopolis were impressive though we only managed a quick peek. We did however investigate the catacombs of San Giovanni, Syracuse is home to the second largest set of Catacombs in the Christian world (after Rome), and they were well worth seeing, especially impressive was the altar from which St Paul is said to have preached. 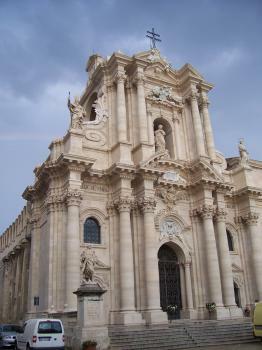 If there is one monument that best represents Siracusa then it has to be the Duomo (Cathedral in picture), not only does it sit on the most impressive square in the city but also it has developed constantly like the city. It started life as a Greek Temple and the huge Doric columns give it proportion and bulge out from the side they also mark the aisles inside the church. It gives a great sense of how the city has developed showing traces of Greek, Roman, Paleo-Christian, Byzantine, Norman, Arab and Baroque influences. 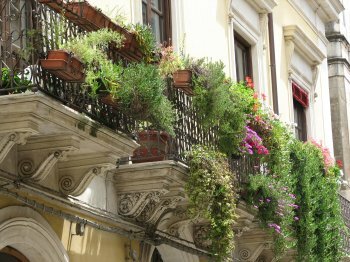 The newly restored façade is a high point of Sicilian Baroque and completes one of the highlights of the city. Siracusa was inscribed on the World Heritage list in 2005 and I was left wondering why it took such a long time to find its way onto the list. ICOMOS states that there is no place that can match Siracusa in terms of its original influence coupled huge array of subsequent development that has turned it into the charming city it is today. Built in the 8th century BC: Syracuse: "From the ancient Greek period to the Baroque" - founded ca. 734 B.C.